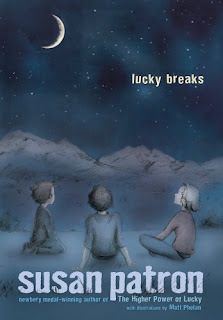 Lucky, heroine of Newbery-Award-winning The Higher Power of Lucky, returns in this, her second book. She is nearing the end of her tenth year, and the amazing and alluring possibilities of being eleven are on the horizon. Her best friend Lincoln is entering a knot-tying competition, and if he wins, he'll get to go to England for the entire summer - and Lucky feels pretty bleak inside when she thinks of an entire summer without Link. Then something wonderful happens. Lucky meets Paloma, a girl just her age, who has traveled to the tiny desert town of Hard Pan (population 43) with her uncle and a bunch of other geologists. Paloma makes Lucky laugh, and each immediately understands what the other is thinking just by looking at each other. Lucky's never had a girl best friend before, and she loves it. The only problem is that Paloma's parents don't think the desert is a suitable place for Paloma to visit - and heaven knows what they'd think if they met Lincoln, with his bizarre knot-tying obsession, not to mention Lucky's other friend, precocious Miles (whose favorite book, which he carries everywhere, is Brain Surgery for Beginners). Best to keep them as far away from Paloma's parents as possible, thinks Lucky. But plans and intentions are often changed by unforeseen events, and Lucky has a few things to learn about friendship before she'll be able to figure things out. I waited a long time to read this one, mostly because I loved the first one so much, and I was worried I might be disappointed by the sequel. Happily, I found that I may even like this one more than the first - but I'm so happy there are both! My favorite thing about these books is most definitely the characters. Lucky shines, but I adore Lincoln, with his honesty, intelligence and sense of humor - and Brigitte, Lucky's French stepmother, is amazing. I would consider moving out to the middle of the desert myself if I could have these people as neighbors- not to mention Brigitte's wonderful cafe to have lunch at on the weekends. Lucky spotted a worm, a big soft fat one. The word for not wanting to touch a big soft fat worm is squeamish, which has a built-in sound of exactly the feeling in your fingers as they reach for that worm. Being, like Charles Darwin, a scientist, Lucky un-squeamished her fingers. Worms grasp their branch strongly, so you have to get a really firm grip on their bodies in order to pry them off. Pete was tall, with big arm muscles and an energetic face. When he spoke, his eyes, eyebrows, mouth, and even his ears moved a great deal; they were acrobatic. Although he was clean shaven, his beard was the type to already be growing out again the minute he finished shaving. It was an enthusiastic beard. Lucky often had an urge to touch his cheeks, which looked scratchy in a handsome way, but instead she stared at them quite hard. When she did this, Pete himself would rub his cheek, as if he were feeling it for her. The illustrations are perfectly suited to the story - they evoke the dry-as-dust atmosphere of Hard Pan and the characters are exactly as described by the author. I just wish they had been reproduced in a larger size. Here is an interview with illustrator Matt Phelan. The Higher Power of Lucky caused a bit of a stir among those people who hear a book contains a single, potentially objectionable (for whatever reason) word and decide that the book must therefore be kept from the hands of impressionable children at all costs. The word in question here is "scrotum," and Lucky hears it mentioned in passing when someone says their dog was bit by a snake on that particular part of the anatomy. I was pleased to see that Patron stuck to her guns and made mention of the same detail (as it applied to the story, once again). I'm glad she didn't back down. There is mention in the acknowledgments at the back of the book of future events that are to befall Lucky and her companions, which was great news. I can't wait to revisit the wonderful town of Hard Pan and its eccentric, endearing residents. Becky's Book Reviews: "What did I enjoy most about this one? Mostly Lincoln. Sure, I enjoyed Lucky. At times. But Lincoln is such an amazing person--an amazingly patient person--to care for her as he does. To be her friend through thick and thin." Musings of a Book Addict: "There are a lot of lessons to be learned here about friendship and growing up. It wasn’t preachy about these topics in any way." Readingjunky's Reading Roost: "She keeps Lucky true to her original character and adds just the right combination of adventure and new intrigue to keep readers waiting anxiously for the final episode." oh my gosh. Daughter and I absolutely loved the first book. We bought it specifically because some people wanted it banned. Will be on the look out for this one. Oh, I didn't know there was going to be a sequel, so I am happy to see it is out! Heather - You are in for a treat with this one - can't wait to hear what you and your daughter think of it. I've been thinking these would be good read-alouds for my own kids. My list of read-alouds is getting as long as my regular TBR at this point! Kailana - I hope you enjoy it as much as I did! I really want to read both books. And even though I work in a public library, I am somehow still shocked and amazed that anyone could object to the word "scrotum" in any book. Seriously, I would hope that any child old enough to read this book or have it read to them would have some understanding of basic anatomy. Hey, my word verification word is real! It's "surly." Perhaps prescient, as people trying to censor books certainly makes me feel quite surly. Hooray - I love it when a sequel lives up to my expectations! I want to read them both. Also, the cover is so pretty! Nymeth - I think you'll enjoy both of these - they each made me teary-eyed, but in a good way. I'll be looking forward to hearing what you think! I wonder if I'll ever get around to reading all of the Newbery books? I don't remember even hearing of the one before this book before. Ladytink - I've read a lot of them, but not all! There are so many, since they've been doing it for such a long time. This one is fairly recent, and I hadn't even heard of it till it won. It was a fun surprise! I adore the cover and both this and the first book sound lovely. People are so silly wanting it banned for scrotum, how is that a bad word? Rhinoa - I agree - the illustrations are fabulous, and what is UP with the fuss about scrotum? So silly. The books are just wonderful, so moving and honest and funny. I hope you'll have a chance to read them some time.